Educators and supporters wearing red flooded Phoenix and Denver Thursday in the latest wave of teacher protests. More than 100 school districts in Arizona and at least 20 in Colorado, including the largest districts in both states, canceled classes Thursday because of teacher walkouts, affecting more than a million students. Teachers in both states marched to their capitol buildings to pressure lawmakers to increase funding for education. The Arizona teachers, organized by the teachers union and a grassroots group called Arizona Educators United, are demanding a raise for teachers plus a $1 billion increase in school spending and higher pay for school support staff. Last week, the groups conducted a vote, and 78 percent of about 57,000 teachers who cast ballots supported the walkout. Organizers have not said how long it will last. Republican Gov. Doug Ducey has proposed a plan that gives teachers a 20 percent salary raise by 2020, but some teachers say that is based on overly optimistic revenue projections and does not address their other concerns. Although a 20 percent raise sounds like a lot, that would still leave Arizona teachers beneath the national average in teacher pay, Joe Thomas, the president of the Arizona Education Association, told Education Week. “We’re just trying to get competitive salaries,” Thomas said. Average teacher pay in Arizona ranked 43rd nationally at $47,218, according to 2016 data compiled by the National Education Association. Ducey said Wednesday he would not change his mind and expected the strike would end when teachers realized he was giving them a good deal, the Arizona Capitol Times reported. Thomas told the Capitol Times the governor has refused to meet with him and other advocates for teachers. The governor appeared on several local news programs Thursday morning to promote his plan and ask Arizona residents to urge their lawmakers to approve it. Several state lawmakers have expressed strong opposition to the teacher walkouts. House Majority Whip Kelly Townsend, a Republican, posted on social media that she is considering a class action lawsuit against the teachers for those impacted by a possible extension of the school year. She also asked teachers from schools that closed due to the walkouts to email her if they oppose the strike. She said she would respond to them so they have documentation in case participating teachers are disciplined, Tucson.com reported. Republican State Rep. Maria Syms wrote in a contentious op-ed that the teachers organizing the walkout claim to be bipartisan but are really socialist “political operatives.” Parents have expressed a range of opinions about the walkouts, but for many the primary concern is finding reliable childcare when teacher strikes keep students out of school. Arizona was the latest in a series of red states to see teacher demonstrations, but in Colorado, where Democrats control the statehouse and the governor’s office, the state’s two largest districts announced closures for both Thursday and Friday in anticipation of the walkouts. Teachers are demanding higher spending on education and want the legislature to freeze tax cuts until per-student spending reaches the national average, the Denver Post reported. Organizers stressed that teachers were using sick days or personal time to participate in the rally. Public opinion is crucial in Colorado because state lawmakers cannot raise taxes without voter approval. 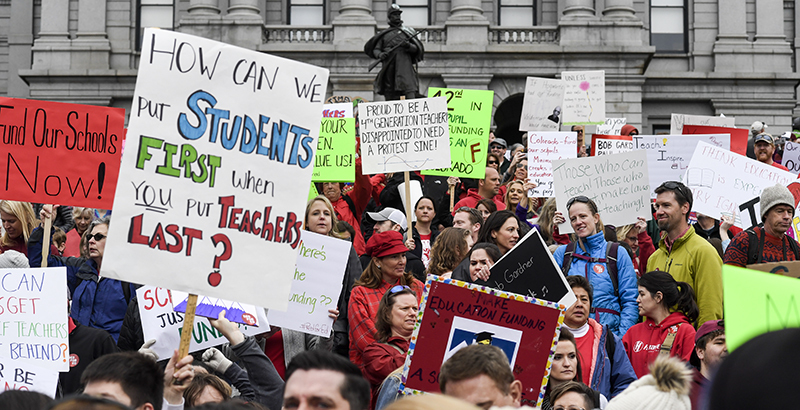 Earlier this year, teacher walkouts in West Virginia earned teachers a 5 percent raise. Walkouts in Oklahoma and Kentucky also raised awareness and pressured lawmakers to increase teacher pay.